The clock is not damaged and is in a new, resalable condition, with all the original packaging and content. An RMA (return merchandise authorization) is obtained from us before returning the clock, by contacting us at sales@keilsclockshop.com. The customer is responsible for the cost of shipping and insuring the clock to be returned. Keil’s cost for insuring and shipping the clock to the customer plus any restocking fee( if applicable) from the manufacturer will be deducted from the purchase price. All our clocks include the full manufacturer’s warranty. Most clocks have either a one or two year manufacturer warranty. Howard Miller and Bulova provides a one year warranty on most clocks and a two year warranty on grandfather clocks. Hermle provides a one year warranty on most clocks and a three year warranty on grandfather clocks. 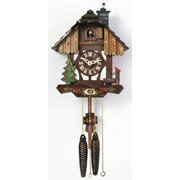 Rhythm clocks, Seth Thomas clocks, and River City Cuckoo clocks all carry a one year warranty. Keil’s Clock Shop is an Authorized service center for Howard Miller, Sligh, Hermle, Ridgeway, and Seth Thomas. Please contact us at sales@keilsclockshop.com prior to shipping clocks to us for repair. All orders placed on keilsclockshop.com include free shipping within the continental United States. Shipping method will be ground UPS, FedEx, or Homedirect depending on the item purchased and the address being shipped to. You will receive a confirmation email with the shipping information for the item purchased. If faster or different delivery options are required please call 1-800-455-6866. Keil's Clock Shop does not ship outside the continental United States or accept orders from outside the continental United States at this time. Keil's Clock Shop has the guaranteed lowest prices on the internet. Keil's Clock Shop will meet or beat any advertised price on the internet by an authorized dealer of a new, undamaged, in stock clock. Clocks sold by auction excluded. If you find a better price please contact us at 1-800-455-6866 and we will meet or beat the price as long as our manufacturers allow us and it is not below our cost. Please call us prior to ordering as we cannot match the price after your order has been processed. We do not charge sales tax on any item shipped to any state except Illinois. If you have a shipping address in Illinois, we are required to charge sales tax. If you are within driving distance of our clock shop, please stop by. We have hundreds of clocks in our showroom, including many grandfather clocks, floor clocks, wall clocks, mantel clocks, cuckoo clocks, motion clocks, and antique clocks. Not to mention spectacular in store deals. Most clocks on the website are in stock. If the clock is not in stock and is on back order, you will be notified by email of the estimated shipping date. No action on your part is required unless you wish to cancel your order. You can cancel your back order by calling 1-800-455-6866. It is our mission at Keils Clock Shop to provide superior customer service during every phase of the order process. To ensure the lowest possible price, some clocks are shipped direct from the manufacturer. We place every order as quickly as possible to ensure the customer will receive their clock as soon as possible. Once your order is processed, we will be unable to cancel it. If you would like to return your order, please refer to our return policy. Orders that are refused by the customer will be subject to all shipping, insurance, and (if applicable) manufacturer restocking fees.